Come tomorrow it is time to begin the St. Andrew Novena. It's not a novena really but a way of preparing for the great feast of Christmas. The tradition is that one should say this prayer 15 times every day from the feast of St. Andrew until Christmas. 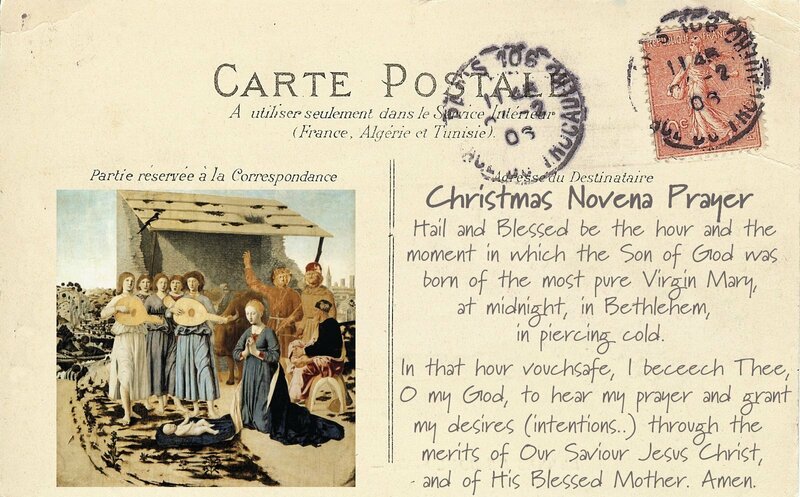 It is piously believed that whoever recites this prayer 15 times every day until Christmas will obtain what one asks. Of course, one may not because God has something better in mind! A quick search on the internet and it is clear that the St. Andrew Novena is alive and well! For some of our sisters, it is a custom learned in childhood, others never heard of it. We don't know the origins but it is thought to have come from Ireland. Wherever and whenever it started, the St. Andrew Novena is a wonderful way to observe the season of Advent. It's easy to learn this prayer and if you decide on a "method of attack" you can remain faithful to reciting it 15 times every day. Some people like to do it in groups of 3—morning, noon and night. Others like to do it all at once, say before Holy Mass or as part of their Thanksgiving after Mass. Another way is to recite the prayer before each mystery of the Rosary. Our novices post it on the medicine cabinet in the bathroom and prayer while brushing their teeth! Leave it to novices! Below is a lovely "holy card" of the Novena. Special thanks to Under Her Starry Mantle for its use.